So I was working on a post for mom.me, wherein I used these heart-shaped ice cube trays that I happened to have from that time I made THESE. And I was thinking, well, what if someone doesn’t HAVE a heart-shaped ice cube tray? Or doesn’t WANT a heart-shaped ice cube tray? But still wants to make super cute chocolates? So I Pinterested and Googled and Insta-ed, and found a whole wide world of ICE CUBE TRAY CHOCOLATES. And proceeded to take every ingredient out of my pantry to start experimenting. You need to make these. And come up with your own amazing flavor combos and share them right here with all of us. 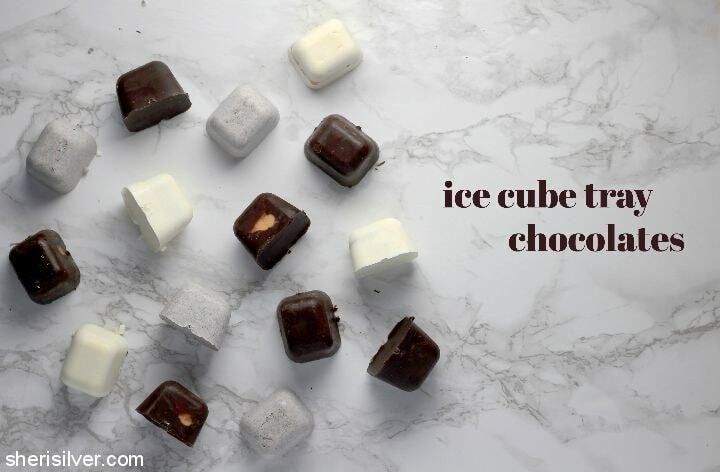 I’ve got the “recipes” below, but the basic formula – using the basic ice cube tray that you’ll find in your basic hardware or grocery store – starts with 12 ounces of chocolate chips (yes, just regular old chips – no feves, bars or wafers needed). Melt ’em up and pour a little into the bottoms of the (lightly greased) tray. Tilt the chocolate to coat the bottoms and sides and pop in the freezer to set. Add your fillings, pour the remainder of the melted chocolate over, tap to level and freeze again. Just imagine giving a box or bag of these to a loved one on V-Day. 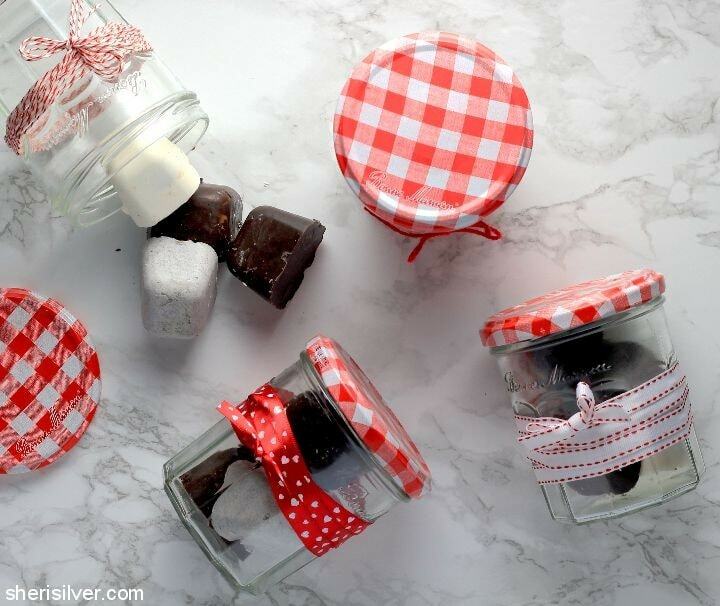 Fancy-pants chocolates that YOU MADE. Note: This is one of those recipes where you’ll have to do a little experimenting, based on the size/quantity of your ice cube tray(s) and the types of fillings you use. The fillings I made are based on a 12-cube tray (each cube holding about 1 ounce of liquid). I halved the quantities listed below so that I could show you more variations, but feel free to scale up or down as desired; you really can’t go wrong! Lightly spray your ice cube tray with non-stick cooking spray – wipe out any excess. 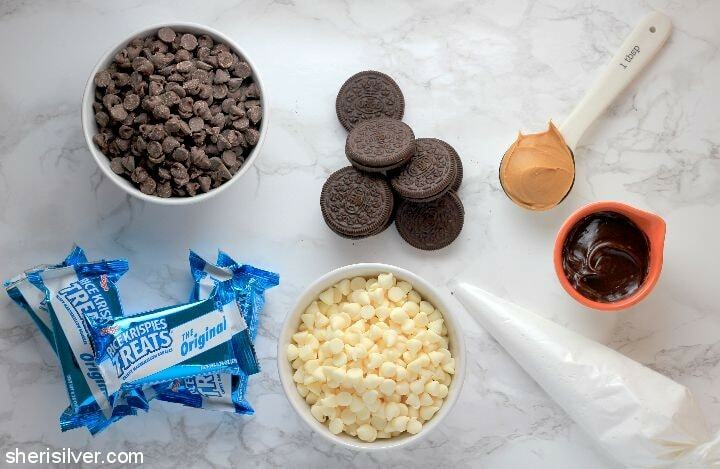 Separate the Oreos – scrape the filling into a small bowl; crush the cookies into fine crumbs. Melt the chocolate in the top half of a double boiler set over barely simmering water. Remove from heat and add half the cookie crumbs. Spoon some melted chocolate into the bottoms of your ice cube tray – tilt to coat the bottoms and partially up the sides. Pop in the freezer for 5 minutes. Add the confectioner’s sugar, butter and milk to the Oreo filling – beat till light and fluffy and transfer to a piping or ziploc bag. Pipe some filling into each cavity of the ice cube tray and sprinkle with the reserved cookie crumbs. Spoon the remaining melted chocolate on top (you may have to re-heat it if it has hardened), smoothing with a knife or angled spatula. Tap the tray on the counter to level and return to the freezer to set completely. Melt the chocolate in the top half of a double boiler set over barely simmering water. Remove from heat and spoon a bit into the bottoms of your ice cube tray – tilt to coat the bottoms and partially up the sides. Pop in the freezer for 5 minutes. Place the fluff and hot fudge sauce into piping or ziploc bags. 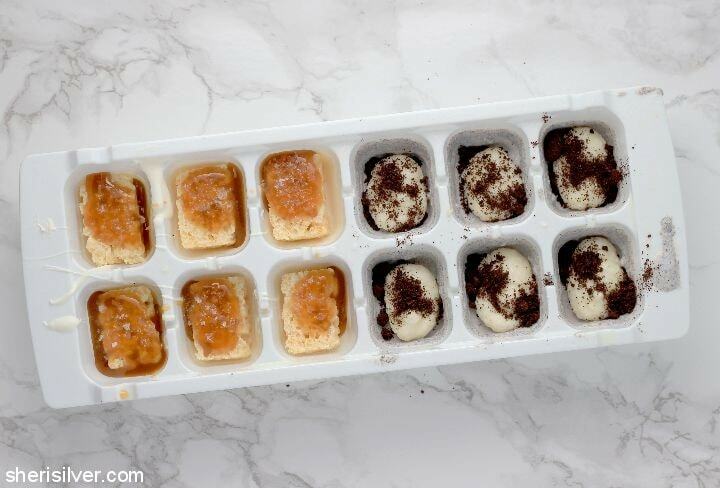 Pipe some fluff into each cavity of the ice cube tray; repeat with the hot fudge sauce. Sprinkle with the crushed graham crackers. Spoon the remaining melted chocolate on top (you may have to re-heat it if it has hardened), smoothing with a knife or angled spatula. Tap the tray on the counter to level and return to the freezer to set completely. Place the caramel sauce into a piping or ziploc bag. 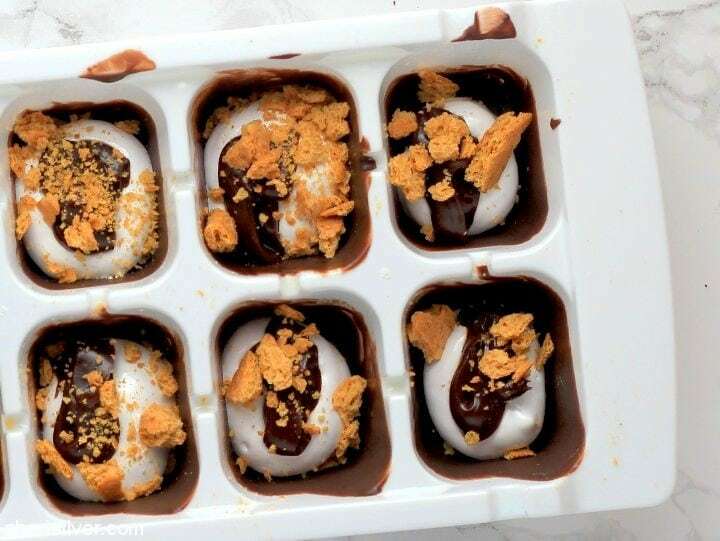 Trim the rice krispies treats and place into the cavities of your ice cube tray. Pipe some caramel sauce on top of each rice krispies treat, followed by a pinch of sea salt. Spoon the remaining melted chocolate on top (you may have to re-heat it if it has hardened), smoothing with a knife or angled spatula. Tap the tray on the counter to level and return to the freezer to set completely. Beat the peanut butter, confectioner’s sugar and butter till fluffy; transfer to a piping or ziploc bag. 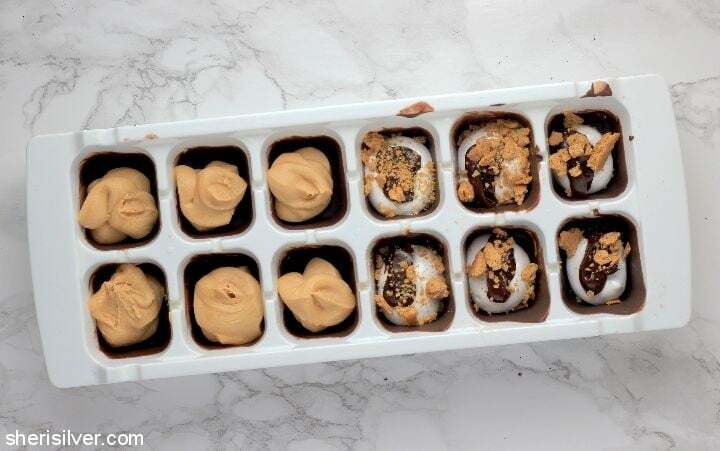 Pipe the peanut butter filling into each cavity of the ice cube tray. Spoon the remaining melted chocolate on top (you may have to re-heat it if it has hardened), smoothing with a knife or angled spatula. Tap the tray on the counter to level and return to the freezer to set completely.